👉Imagine letting people put you down. These people are in your family, church, workplace, neighborhood and amongst your friends. Does the thought of that make you feel you are worthless? Or maybe, like me, it motivates you to stand tall above their wagging tongues and degrading lips? I know that belittlement, which sets in when you are not applying your image skill in the face of scorn. Ha! Well, I would like for you to start taking control. 👉When people talk badly of you, envious of you, bring you down or just dislike you for no good reason usually, what stands in their way is their lack of self-confidence, pride or poor manners from wherever they are coming from or struggle for their own identity. So, instead of focusing on feeling less like the ugly duckling, finding yourself through wrong or forceful means, what you really need to do is to put your time and energies into building your “image skills.” Otherwise, as this awful people constantly wrestle with the issue of image in their lives, they would continue to bring you down. 👉I tell you, most of the dejection we experience in life sometimes comes partly from opening ourselves to the bile of the awful people around us and from not understanding who we really are. From now on, you must center your efforts not on replying to their attacks or feeling worthless but on changing your perspective on the damage they are posting. Consistently filter out their negatives. Have a positive attitude. 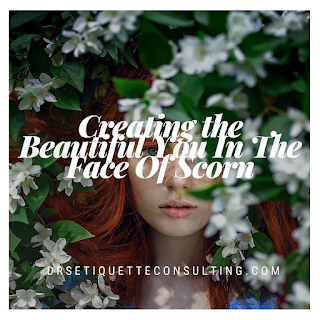 Create a much more beautiful you. Consciously or unconsciously, decide the tone of your image. 👉So what kind of image do you want to create for yourself? It should be that of prominence because you are sons and daughters of greatness. You should want the best for yourself regardless of what anyone tells you or thinks of you. 👉To begin with, how do you measure your worth? What do you think you are worth? If you are loving, kind, beautiful, decent, intelligent, sound, bright, smart, ambitious, charming, honest, admirable etc, then, this should be the qualities you choose to see when people say otherwise about you. Your choices should be based on these values, not the ugly things your mood tells you because of the bad which has been said about you. Choose your moods, actions, words, and attitudes, the terrible things flying about you shouldn’t do it for you. 👉Additionally there other things you need to learn to create the beautiful you like acquiring new skills? Go for it. Don’t just stand in the wave of your antagonists’ wrath. Have a clear mind and pioneering spirit in adapting your new skills. Have in mind that not everyone would appreciate you, love you, be your true friend or perceive you the way you are. So I advise you . . . Be Positive. Be Worthy. Be Healthy. Be Beautiful!